this past week has been filled with lots of wonderful rain and crazy thunderstorms. yesterday was no exception. so, i decided to make this delightful cornbread to warm me up! what else is better than some homemade comfort food to get you through those grey days? Skillet or Baking Pan: Use either a 9-inch cast iron skillet, or an 8-inch metal baking pan. Preheat oven to 425 degrees. In a large bowl, whisk together the flour, cornmeal, sugar, baking soda, salt and pepper. Make a well in the center of the flour mixture. Add buttermilk and eggs to well and whisk to incorporate. Gently fold in the cheese and frozen corn. Set aside and let the batter rest. Place butter in a 9-inch cast-iron skillet. Allow butter to melt and remove immediately from oven. Tilt and rotate the pan to evenly distribute and coat the bottom and sides of the pan. Pour batter into prepared buttered skillet and bake until the top is golden brown (there will be some caramelization). Test doneness by inserting toothpick in center and it comes out clean – about 20-25 minutes. 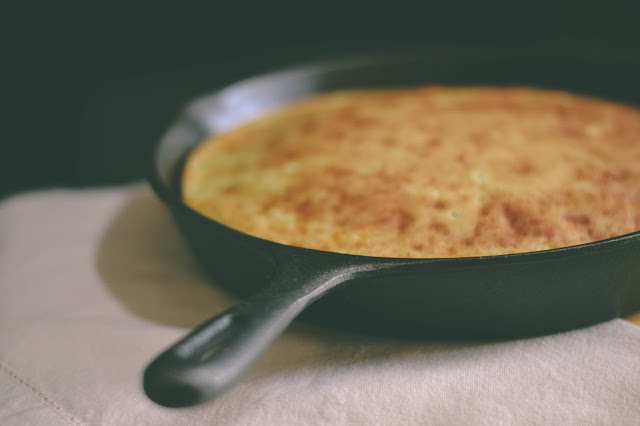 Let the cornbread cool in the skillet AT LEAST 15 minutes before cutting to serve. Wrap cooled leftovers in air-tight container or plastic wrap for up to one day. N O T E : this is best served warm + fresh, but it's also great the next day! this morning i warmed it up and ate it with a fried egg, sautéed red peppers + goat cheese for breakfast - so. good.